Whenever an unexplained rash appears on the skin there is always concern. Is the rash just a minor ailment or is the rash an indication of a more serious underlying health problem? Is the skin rash viral, bacterial, fungal, or allergy based? If there is concern then advice from a medical doctor should be obtained. In fact, in some skin rash cases, emergency medical assistance is a must. In many cases, that unexplained skin rash could indeed be explained. In order to help identify different types of skin rashes you need to know what type of factors can cause a skin rash. You also need to classify the symptoms. The diagnose my skin rash page provides this information for many different types of skin rashes. In addition, treatment of rashes and prevention tips are also provided. Therefore, by using the information on the above mentioned page, some investigation as to when and where the skin rash occurred and possibly consultation with a physician (where necessary), that rash can be explained. I have been dealing with a kidney stone for the past week and I suddenly came up with this rash that has no other symptoms. 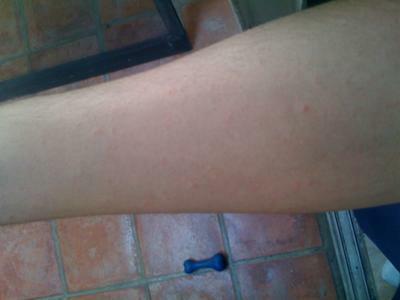 It is just little dots on my torso/arms/thighs, resembling bug bites. It's not really alarming and hard to see unless you're looking for it. I have been taking Toradol for a week also as pain management for the kidney stone. Could this rash be caused by the medication and if so, how could I get rid of it? I have the same flower shaped rash on my forearms. It does not itch and is flat and a pale color that makes it hard to see. The flower petals all seem to run together. I have no fever. The only medication I take is HZT, a water pill. I have been watching my arm for about two years because I did have a BCC removed and I wanted to stay on top of it. As a naturalist, I have used iodine, vitamin E, cannibidiol, and cortizone cream. I don't think I can treat it topically. I feel that it has originated somewhere within my body or is a generalized allergy. It could be the medication, to be sure you have to stop taking it, before you do, you should see your doctor.